Lamey and Lewis have suggested classifying BMS into three subtypes according to variations in daily fluctuations of symptoms. Burning mouth syndrome is a difficult and challenging problem for the dental practitioners. The key to successful management is a good diagnostic work-up and co-ordination between the dental practitioners, psychologist and physician. Sunil A, Mukunda A, Gonsalves MN, Basheer AB, Deepthi. An overview of burning mouth syndrome. Indian J Clin Pract 2012;23:145-52. Dodick DW, Matharu MS, May A, Olesen J. Cephalalgia. Vol. 24. UK: The International Classification of Headache Disorders; 2004. p. 9-160. Klasser GD, Fischer DJ, Epstein JB. Burning mouth syndrome: Recognition, understanding, and management. Oral Maxillofac Surg Clin North Am 2008;20:255-71, vii. Aggarwal A, Panat SR. Burning mouth syndrome: A diagnostic and therapeutic dilemma. J Clin Exp Dent 2012;4:e180-5. Spanemberg JC, Rodríguez de Rivera Campillo E, Salas EJ, López López J. Burning Mouth Syndrome: Update. Oral Health Dent Manag 2014;13:418-24. Barker KE, Savage NW. Burning mouth syndrome: An update on recent findings. Aust Dent J 2005;50:220-3. Aravindhan R, Vidyalakshmi S, Kumar MS, Satheesh C, Balasubramanium AM, Prasad VS. 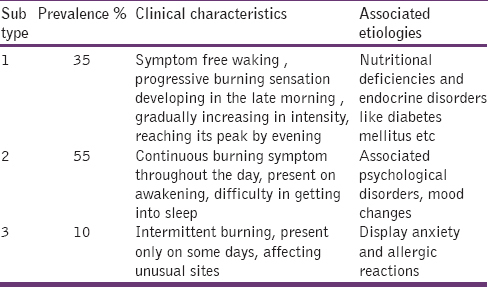 Burning mouth syndrome: A review on its diagnostic and therapeutic approach. J Pharm Bioallied Sci 2014;6:S21-5. Jääskeläinen SK. Path physiology of primary burning mouth syndrome. Clin Neurophysiol 2012;123:71-7. López-Jornet P, Camacho-Alonso F, Molino-Pagan D. Prospective, randomized, double-blind, clinical evaluation of Aloe vera Barbadensis, applied in combination with a tongue protector to treat burning mouth syndrome. J Oral Pathol Med 2013;42:295-301. Granot M, Nagler RM. Association between regional idiopathic neuropathy and salivary involvement as the possible mechanism for oral sensory complaints. J Pain 2005;6:581-7. Buchanan J, Zakrzewska J. Burning mouth syndrome. Clin Evid 2005;14:1685-90. Forabosco A, Criscuolo M, Coukos G, Uccelli E, Weinstein R, Spinato S, et al. Efficacy of hormone replacement therapy in postmenopausal women with oral discomfort. Oral Surg Oral Med Oral Pathol 1992;73:570-4. Sun A, Wu KM, Wang YP, Lin HP, Chen HM, Chiang CP. Burning mouth syndrome: A review and update. J Oral Pathol Med 2013;42:649-55.